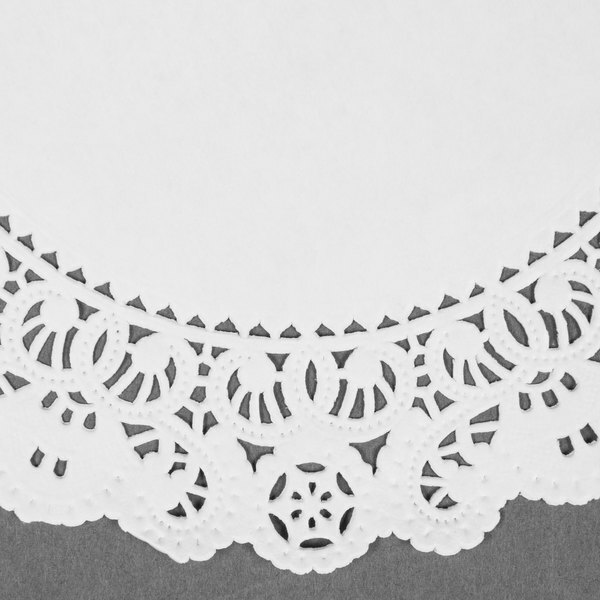 Add another layer of elegance to your already beautiful table settings with our 8" lace doily! "We love these doilies! Neater, easier to pull apart, and saved money per box over our regular supplier. And since we're a bakery, that adds up fast! Thank you Webstaurant!" From being placed beneath plates and cookies to being added as an integral part of banners and homemade greeting cards, these doilies are wonderfully versatile. When you're done using them to decorate tables at your next event, use any leftover doilies for fun crafts and creative decorations! 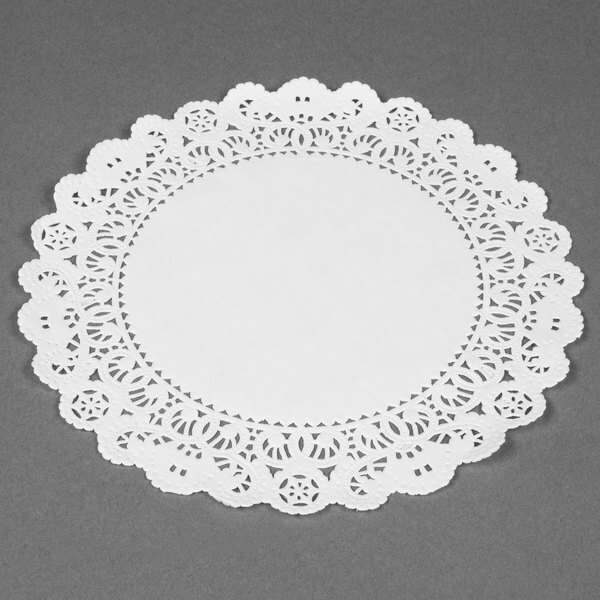 Traditional "normany" doily style. 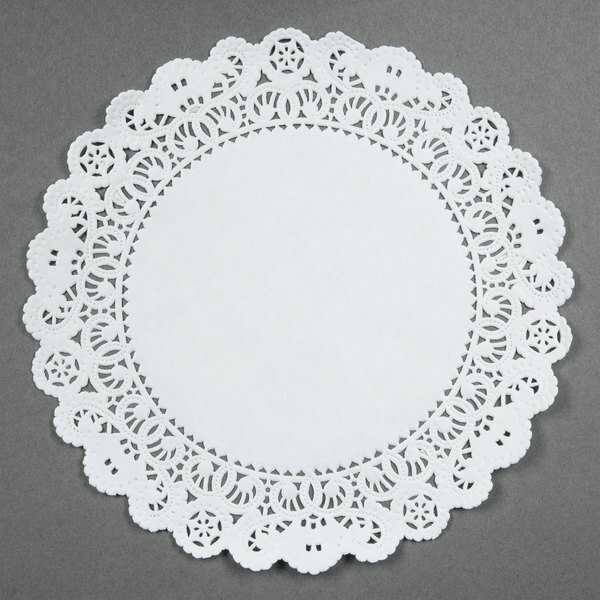 HIgh quality paper made in Canada - holds up well for food service and crafts - a real all purpose paper doily. You can't beat the price on these for one-time-use doilies! We use these against a black table cloth and our setup looks sharp! Then throw them away and start over with clean ones at the next event. These doilies are very nice and adds a nice touch to my baked good. The quality is very good and the price is great for the quantity. Great quality for a great price! We use these as a decoration as well as keeping the bowls and cups from sliding on the plate. Very pretty and dainty doilies. Great value and very compact packaging so then don't take up too much space at your bakery or your shop. 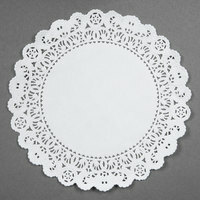 These are great doilies, great quality. I use these under my baked goods, for scrapbooking, diy projects etc. I will definitely be getting more of these in different sizes. Beautiful quality. These doilies fit (2) perfectly in the bottom of the large Cambro storage boxes and keep food from sticking and present beautifully. Highly recommend. THESE 8" LACE DOILIES BRING A LITTLE EXTRA TOUCH OF ELEGANCE TO THE PRESENTATION OF MY CAKES....I ALSO USED THEM FOR PLACEMENT OF DESSERT DISHES AND GOT RAVE REVIEWS FROM FAMILY..THEY ARE NICE BRIGHT WHITE AND ARE MADE OF THIN WEIGHT PAPER SIMULATING THE LOOK OF LACE..THE PACK OF 500 WERE A FANTASTIC PRICE . The 8" Lace doilies are very nice size for use on under our glass bowls. They make the table pop when used with our black table clothes. Very nice doilies. Each one lasts a few days on our tables. They are very reasonably priced, so its affordable to change these very often. I love doilies and this size is perfect for a lot of things, including decoration! I used them to create a vintage country banner for my party, it was lovely! I love these doilies. I use them under cakes, on cookie trays and as a stencil with powder sugar. They are good quality and the price is right! Look good and very inexpensive. We use them all the time for liner dessert trays. Looks nice on glass plates. Only wish I got some larger size. Great price for so many. In party stores they are much more expensive. They came quickly and in good addition. Great to decorate with our use for crafts! These are nice for layered beverages and even tea! They work wonders as under liners for soup bowls, preventing the bowl from sliding off a plate! 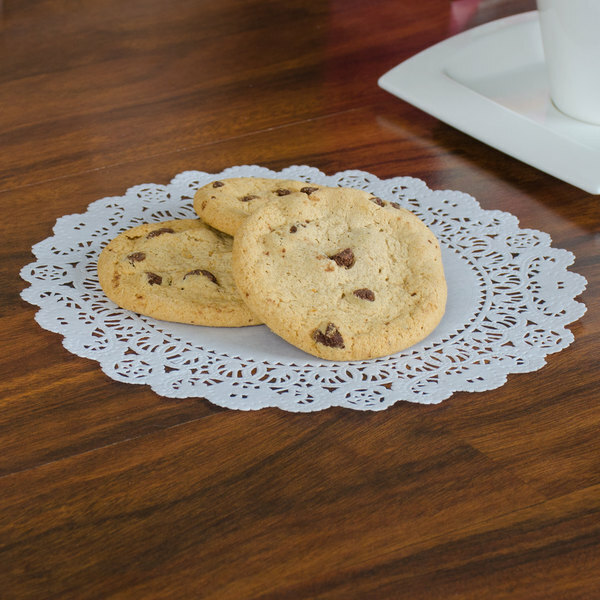 These doilies compliment any cookie tray. A must for caterer's and bake shops. Makes the presentation look so attractive creating more sales. Value, Quality and Price. We are very pleased with these doilies. As a bed and breakfast owner, these work well for the baked goods we provide for snacks as well as for our bread and bacon dishes served at breakfast. very nice product but a few were stuck together and some were ripped were the box was opened. Nonetheless, I admire the quality of the product. Very dainty and somehow reusable. We love these doilies! Neater, easier to pull apart, and saved money per box over our regular supplier. And since we're a bakery, that adds up fast! Thank you Webstaurant! 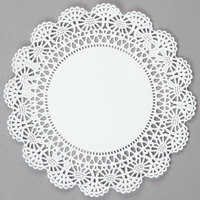 I use these doilies on my table weekly as well as on Holidays, and get many compliments. It is set on each person’s dinner plate and thus it enhances the table as well as keeping the dinner plate clean during the other courses. Our guests feel that our table is very welcoming and richly clad. It really makes my table regal.